Southern Chicken Fried Steak is a staple if you live in the south. Beef cutlets are battered just like fried chicken and served up fresh. Having lived in the South now for more than half of my life, there are a few staple dishes around here that everyone loves. Chicken Fried Steak is one of those dishes. When traveling around in Texas you may be amazed at how many restaurants serve up the best chicken fried steak. I promise it’s more than just one or two restaurants. What are the good characteristics of the perfect chicken fried steak? For me it is using a whole cut of meat, a lot of people use tenderized meat from the grocery store. I don’t like to do this because you don’t know what cut of meat you are getting. I used to work in a grocery store years ago, the tenderizer machine in the meat department was used to weave together scraps of meat. I don’t like knowing exactly what cut of meat I am using. I like to use a lean chuck steak or some thinly sliced sirloin. The breading must be flavorful. So you really need to season your flour. Now, if you live in Texas, I really recommend HEB’s seasoned flour, if not, you can make some homemade. Buttermilk is the key to make a thick crust. Don’t get the low-fat buttermilk. Use regular buttermilk. Buttermilk is like glue that binds that batter to the meat. While not necessary, I love to cook this in my iron skillet. Now, the name is chicken fried steak, so you are going to be frying the meat. I use plain vegetable oil, or vegetable shortening. I cook this in my trusty iron skillet. While the iron skillet isn’t necessary, but I find they are deep enough to cook the steak in. 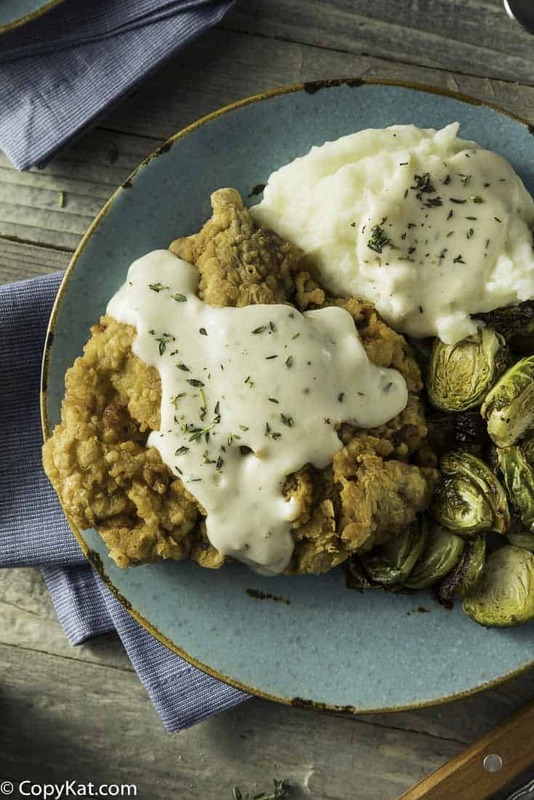 Most restaurants serve a white gravy with their chicken fried steak, and often it is Pioneer White Gravy mix.. It’s easy to prepare, and it works every time. What to serve with Southern Chicken Fried Steak? You might wonder what you serve when you make this classic dish. Texas Toast, mashed potatoes, and green beans are great choices to round out that meal. Where is the Chicken in Chicken Fried Steak? You might wonder where is the chicken in this recipe. There is no chicken in chicken fried steak. It is meat that is battered and fried like you would make fried chicken. In many places in the south, boneless chicken may be referred to chicken fried chicken at some restaurants to distinguish between the beef and chicken option on this dish. 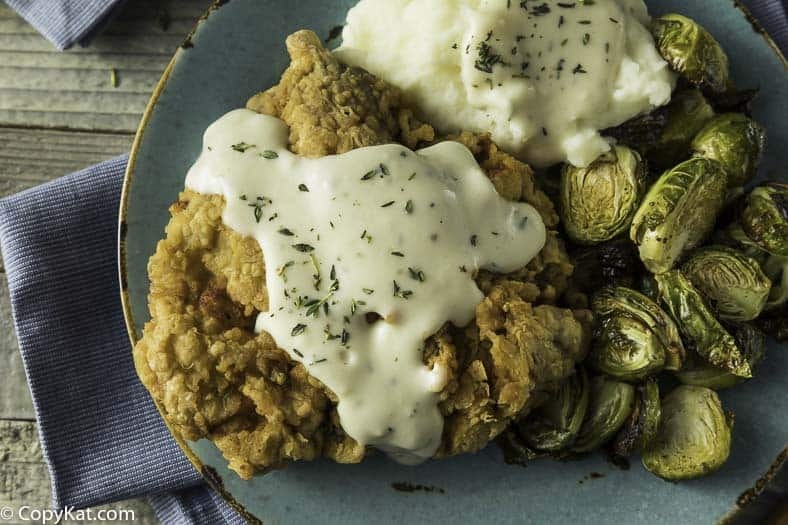 Make classic southern chicken fried steak at home. Prepare seasoned flour by combining flour, salt, ground black pepper, garlic powder, paprika, onion powder. Stir until well combined. Place seasoned flour in a large shallow container. Pour buttermilk in a shallow dish. Batter steak by dusting with seasoned flour. Shake off the excess, then dip into the buttermilk. Shake off excess buttermilk and then place back into the flour. Coat well with flour and then shake off. Place battered steak on a wire rack on a baking sheet. (this will help the crust dry out a bit, and result in better crust). Complete the with the remaining pieces of meat. Add about 3 inches of oil into a skillet. Heat skillet until the oil gets to about 350 degrees. Place meat one or two pieces at a time in the oil, and cook the meat. Do not touch the meat until the top of it looks like it is beginning to cook and brown. Turning the meat too early will mean the crust may fall off. This may take about 7 to 8 minutes for the first side, and about 3 to 4 minute for the remaining side. Remove from oil and drain. You may want to use the Pioneer gravy mix. If not, please see the gravy mix below. Since this gravy is traditionally white, we are not using any beef drippings. In a small pot add 2 tablespoons of butter over medium heat. When the butter melts completely add the flour. Cook the flour for about 1 minute. Add 1 3/4 cup of whole milk. Stir until the mixture thickens. Season with 1/2 teaspoon salt and 1/2 teaspoon black pepper. Consider replacing the AP flour with Wondra Flour. AP tends to continue to thicken where as the mix of Wheat Flour, Malted Barley Flour IMO makes better gravy. I haven’t had a good chicken fried steak since I was in Texas, until I made this. You might want to tenderize it a bit with a tenderizer at home. You could also sprinkle a bit of meat tenderizer on the cut. Adding flour to the gravy recipe? How much flour? Thank you. I apologize. I re-read your wonderful recipe and realized that I missed it. There is no chicken in chicken fried steak. It is meat that is battered and fried like you would make fried chicken. In many places in the south, boneless chicken may be referred to chicken fried chicken at some restaurants to distinguish between the beef and chicken option on this dish. Looks divine. Fried steak is probably my all time favorite dish. One question: do you tenderize your steak since you don’t use the pre tenderized ones? BTW, good info on mystery weaved steak! Don’t think I’ll buy it again! You can ask the butcher to run any type of meat through the tenderizer? I usually buy cube steak that has already be tenderized, but I’m loving this idea. I’m going to give it shot.